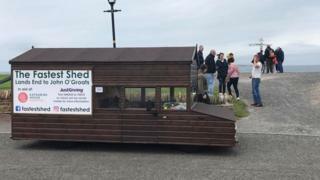 A shed on wheels has reached John O'Groats after a six-day trip to raise money for a hospice. The converted Volkswagen Passat left Land's End on Thursday last week and has been touring the country on its way to the Scottish coast. Owner Kevin Nicks, from Oxfordshire, transformed the car, dubbed the "world's fastest shed", in 2015. He said the vehicle was "faultless" on the trip and he had made many friends along the way. "It's a great way to meet people, you walk into a café and immediately everyone wants to talk to you," he said. Mr Nicks, a 52-year-old gardener from Great Rollright, near Chipping Norton, made the journey with his 14-year-old daughter Sophie. They took an indirect route from Land's End to John O'Groats, travelling 1,398 miles (2,250km), in order to meet supporters and stop at Elvington Airfield Circuit near York to attempt a new speed record. It was hoped the shed would break the 100mph (160km/h) barrier but it fell just short at 96.8mph (155km/h). The challenge was taken on to raise £10,000 for Katharine House Hospice in Adderbury, which provided care for Mr Nicks' mother.